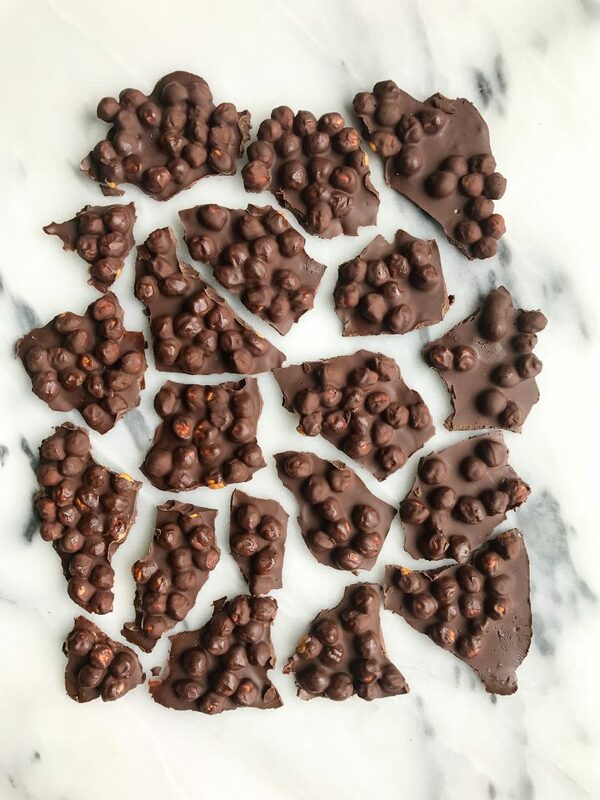 3-ingredient Dark Chocolate Chickpea Bark for a quick and easy healthy snack! I truly cannot remember that last time I had dinner and didn’t crave something chocolatey afterwards. It is my number one habit that I am not willing to break for anything. Even when I did Clean Program, I had chocolate afterwards. I have to say, my biggest habit could be worse and the happiness having some dark chocolate brings me is just indescribable. I am crazy, I know. But I am always looking for new and innovative ways to get that sweet fix and also give an extra nutritional boost at the same time. 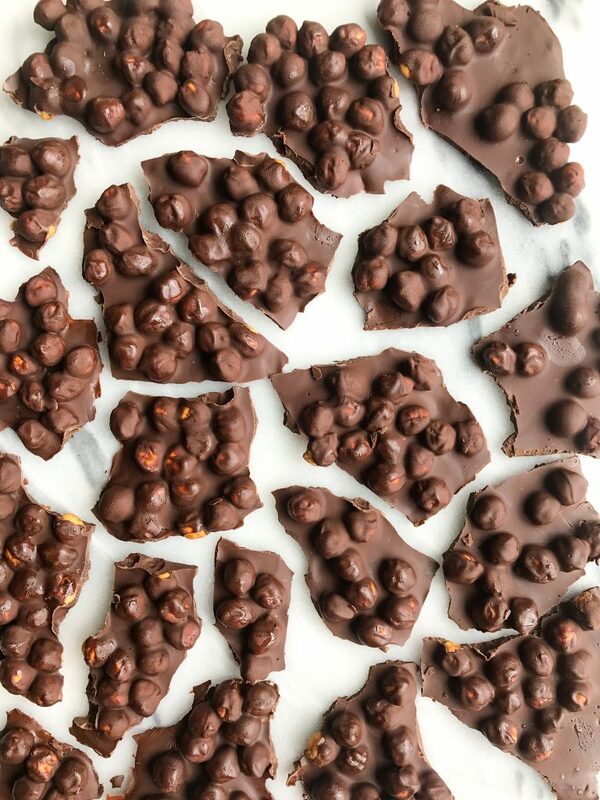 This 3-ingredient Dark Chocolate Chickpea Bark does just that. Typically we think of chickpeas as a savory dish. Something you can pulse into hummus or make into falafel. And don’t get me wrong, that is flipping delicious, but I am excited to introduce a dessert using these pulses in their whole form. Why do I love pulses so much you may ask? Well you may have seen in past recipes that I have partnered with USA Pulses this year to bring you a variety of recipes and inspiration to get your daily pulse intake. 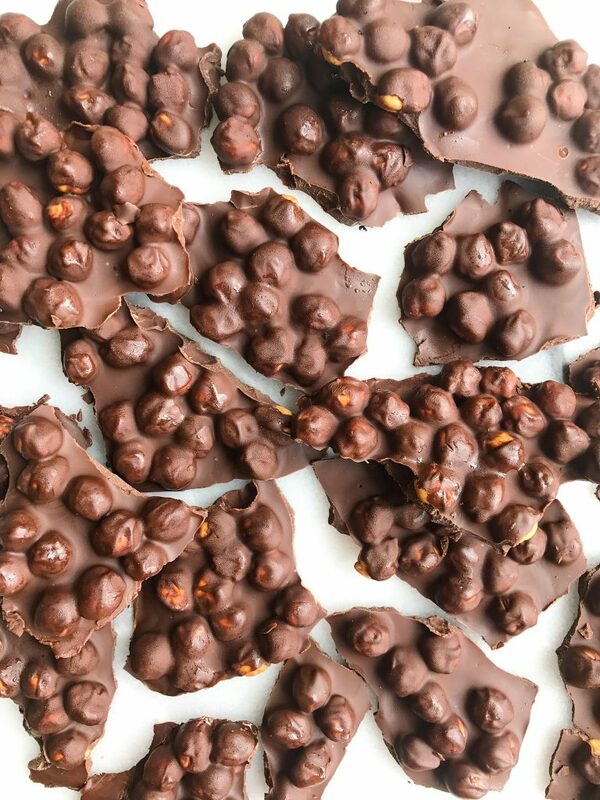 Remember that chickpea granola or those brownie batter truffles? Ya, these are all about the pulses too friends. In case you are scratching your head wondering what a pulse is.. Pulses are edible seeds of legumes like dry peas, beans, lentils and my personal fav, chickpeas. Pulses provide plant-based fiber and protein and they are extremely affordable. They’re easy to include into your diet in a variety of ways and the possibilities are pretty much endless. I have a few more recipes up my sleeve I will be sharing soon using pulses so stock up on some beans, lentils and any of your other favorite pulses. You will need them 😉 And you don’t want to miss the Half-Cup Habit challenge where we are eating 1/2 cup of pulses 3x per week. Easy, delicious and nutritious. Omg, wow this looks incredible! I’ve never even considered doing something like this with chickpeas but I am so intrigued now. Thanks for sharing! Any thoughts about adding a touch of sugar to make it just a bit more sweet? Would this be possible to do without an oven? Like could I roast the chickpeas on a pan? haven’t tried that but definitely let me know if it works!